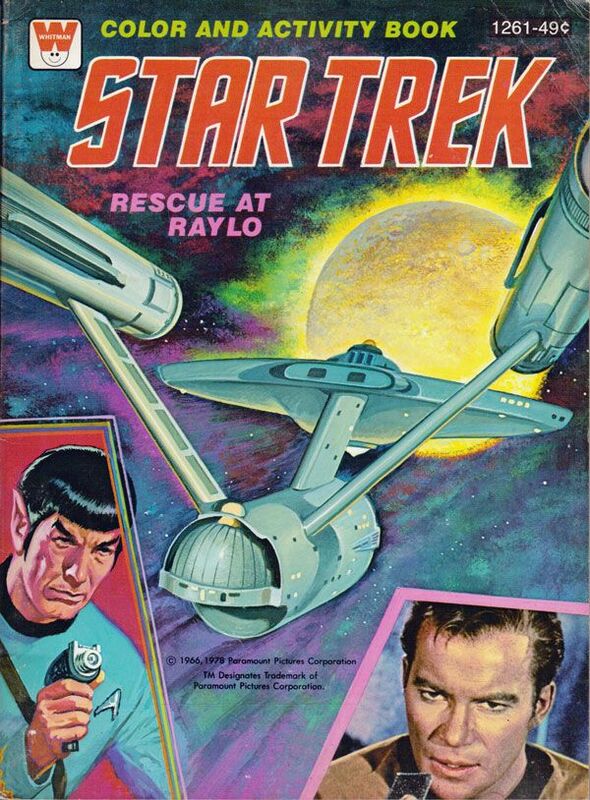 First up... "Rescue At Raylo"! 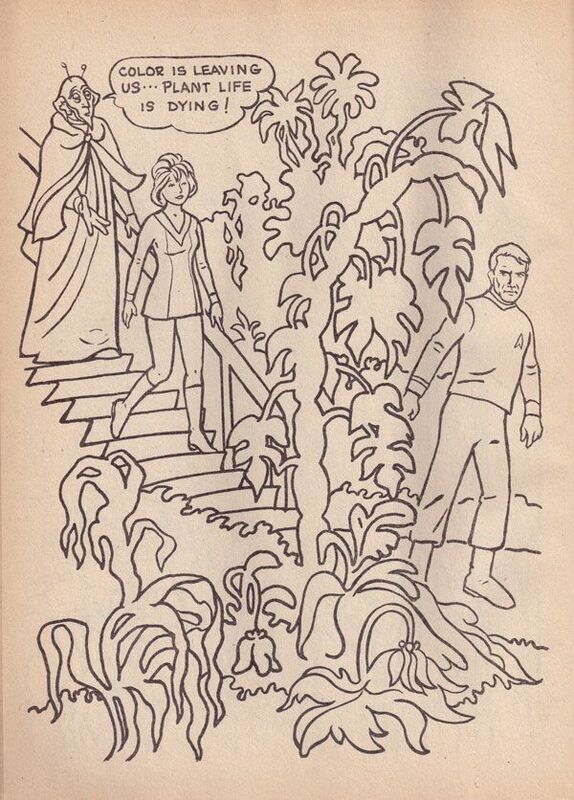 One thing Whitman excelled at was cover artwork, and these coloring books are no exception. Beautiful stuff! 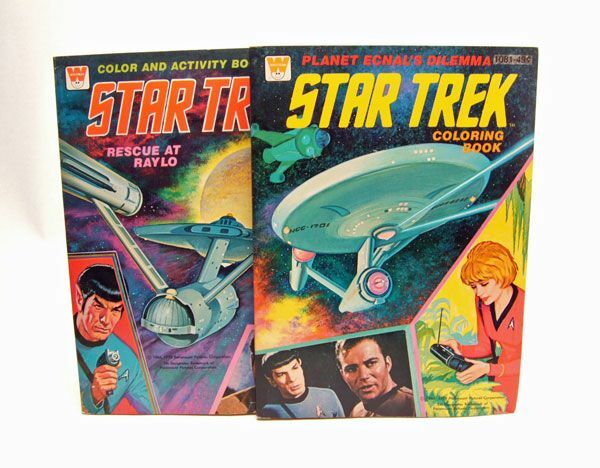 The story starts off with the crew down on the planet Raylo doing a little exploring. 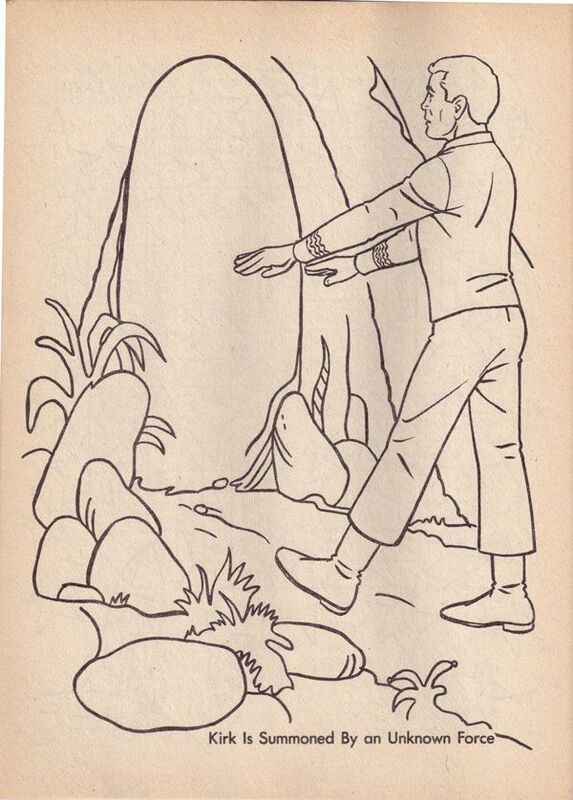 Kirk and Spock are stationed near one of the caves. 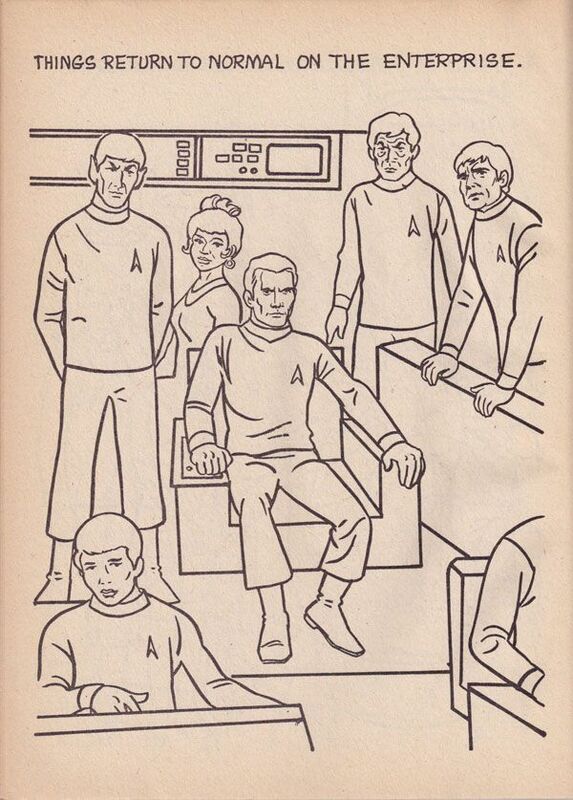 A little ship flies out and zaps Kirk and Spock into unconsciousness. 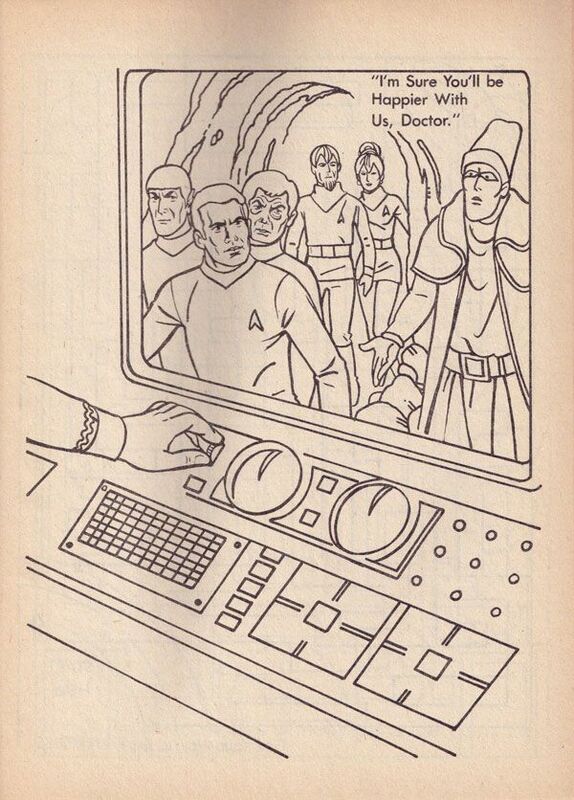 Spock quickly recovers and calls down Dr. McCoy to help the Captain. 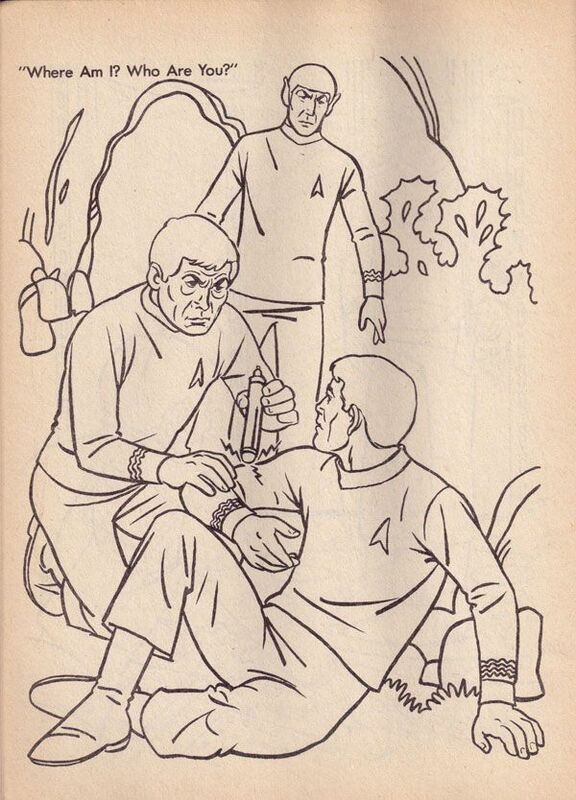 Bones revives Kirk, but when he awakens he is bewildered and starts spouting out a bunch of nonsense. 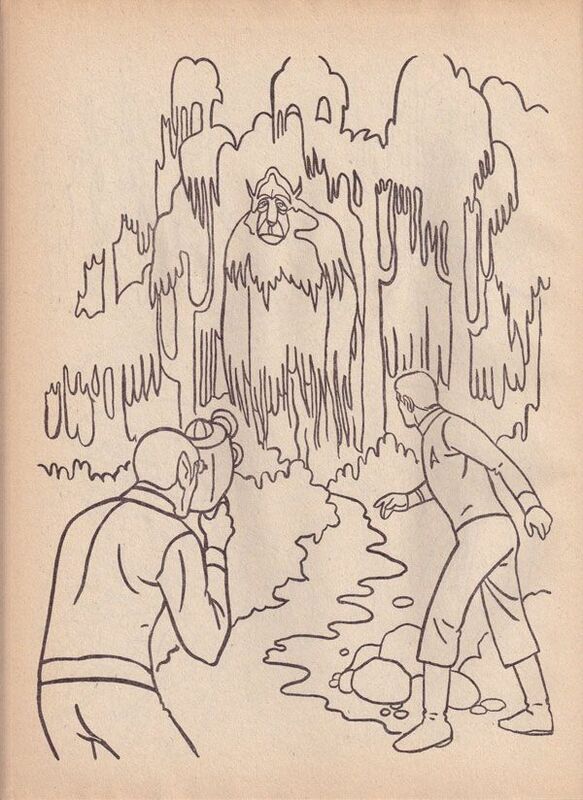 Kirk then gets up and does his best zombie walk right into the cave. 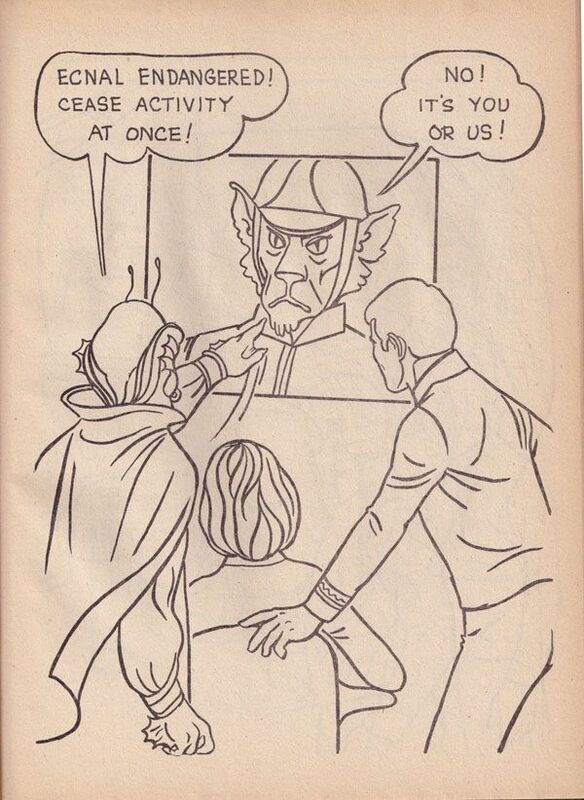 ...where he joins other captured crew members, as explained by the plot's mastermind, the evil Dr. Rycho! Yup. This whole thing is George Lucas's fault. Anyways... 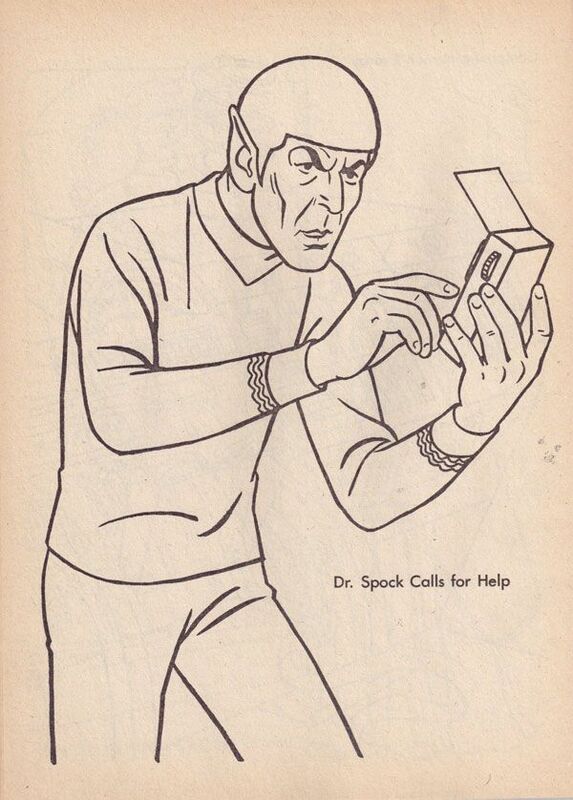 The good "Dr." Spock immediately grabs for his communicator to call the ship for help, but Rycho has already cut off all communications to the ship. 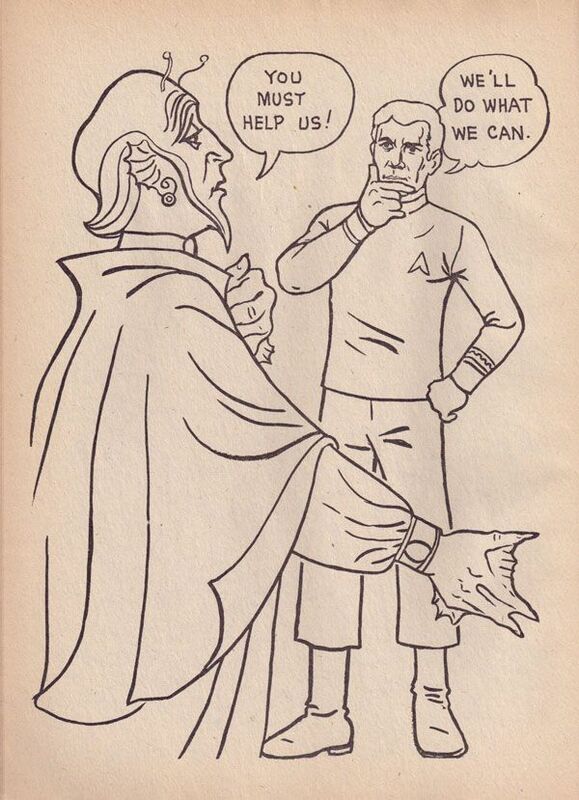 That makes Spock mad. 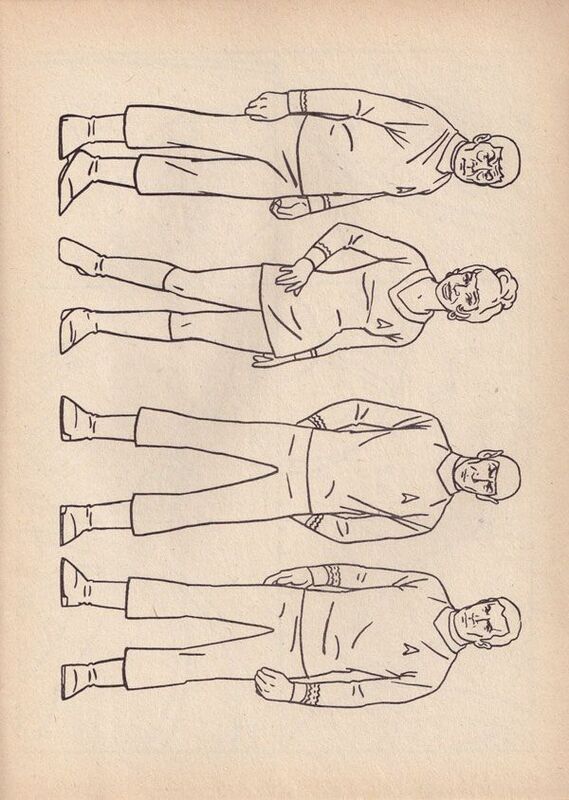 And what better way to vent your Vulcan anger than beating up on people smaller than you? 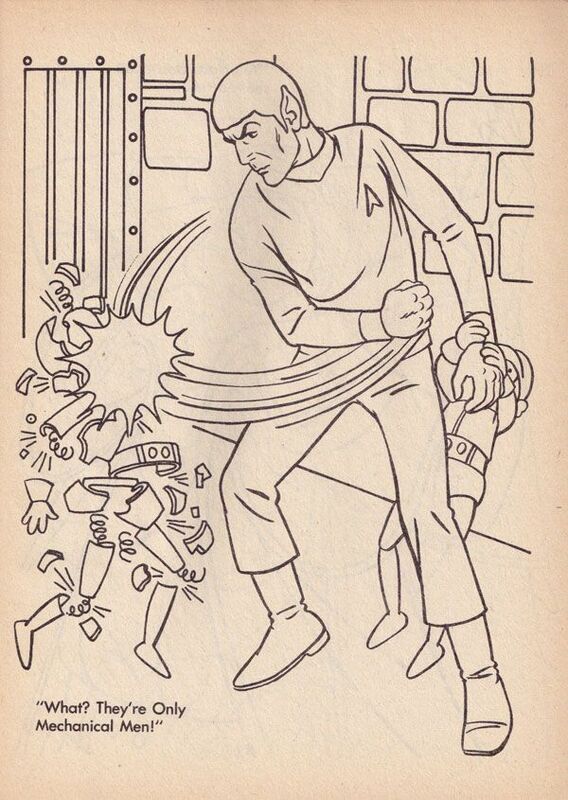 Luckily the Mortards are just robots... but Spock didn't really know that when he threw that haymaker. 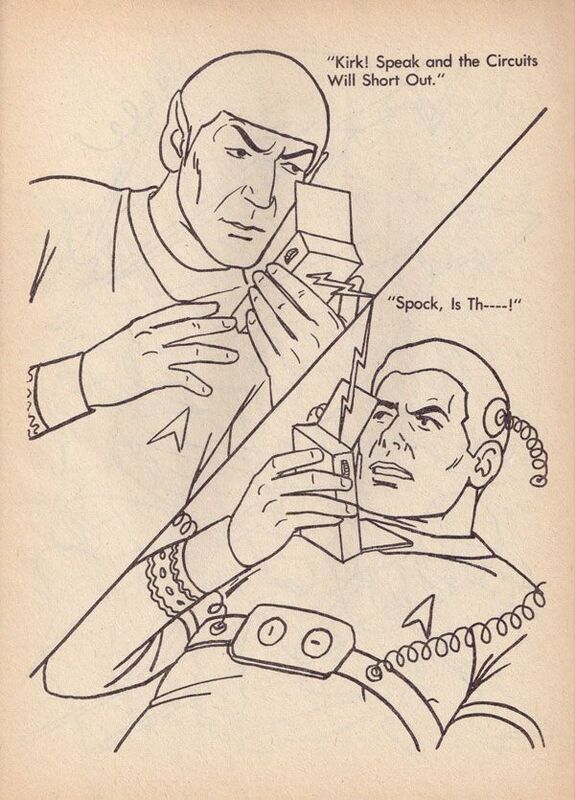 Spock then puts his foolproof plan into action- Call the Captain on his communicator and the computer will short out. Whhhhaaaaaaat?!? Okay. Sure. 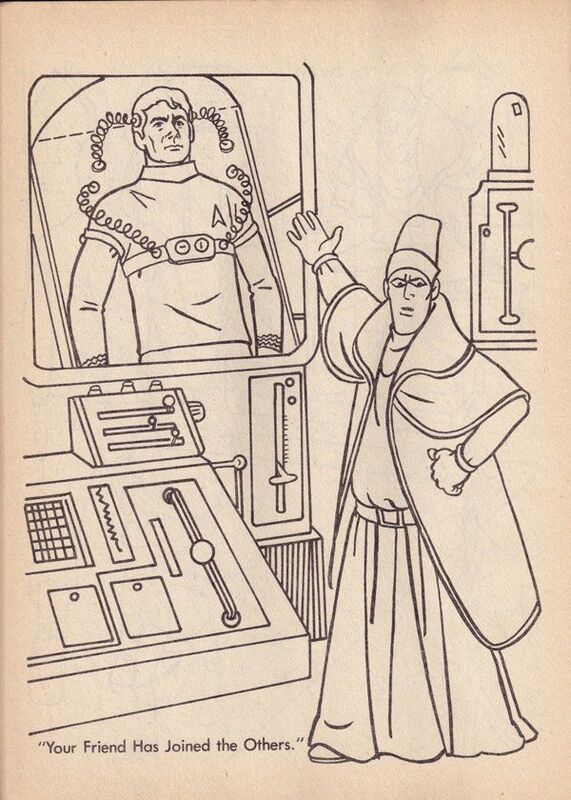 Kirk hulks out of the now malfunctioning machine while a little Mortard gets glass to the eye. 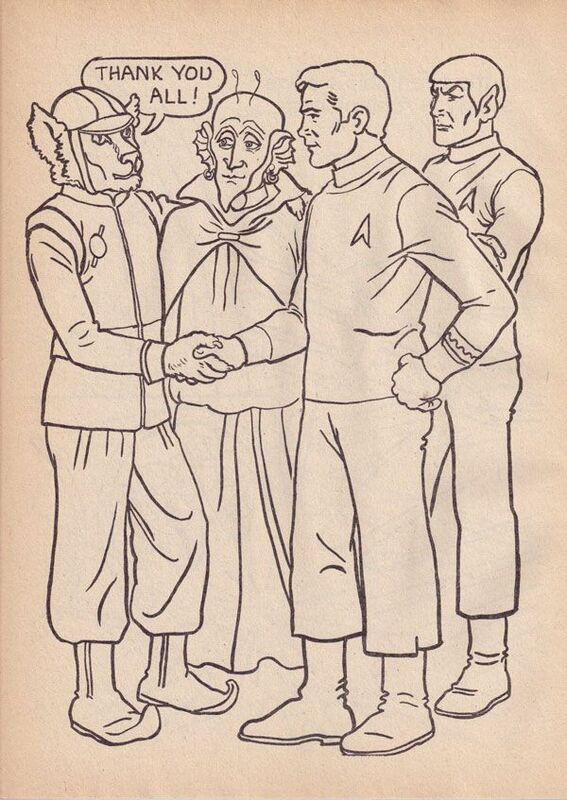 Of course we have to get a happy ending, so Dr. Rycho gets to join everybody up on the Enterprise, where he'll be much happier. Yay! 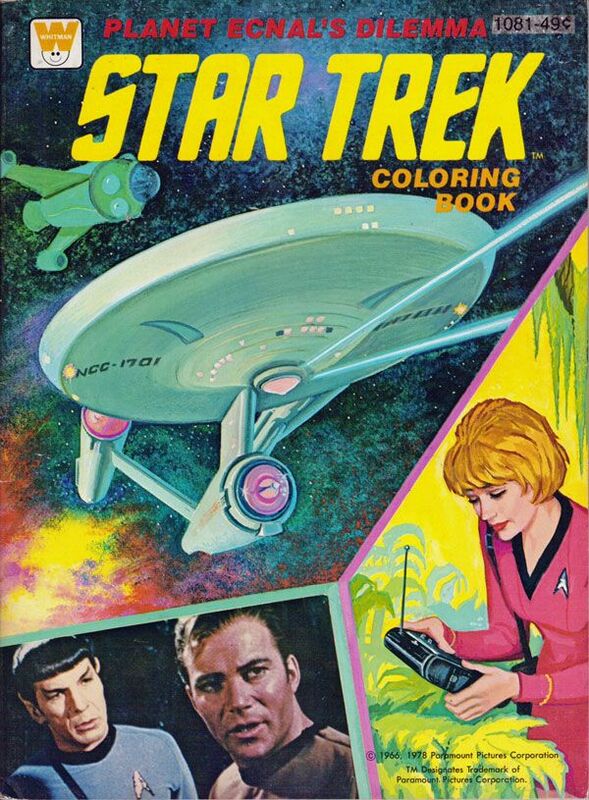 Oh, and this one is a Color AND Activity book, so there's a bunch of fun crosswords and games and stuff. 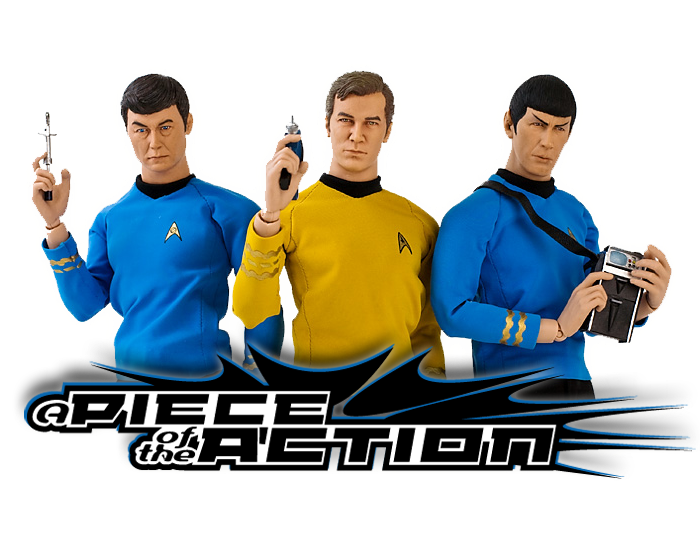 One of the cooler things is a page devoted to "making your own spaceship diorama", which includes those great crew cutouts up there. 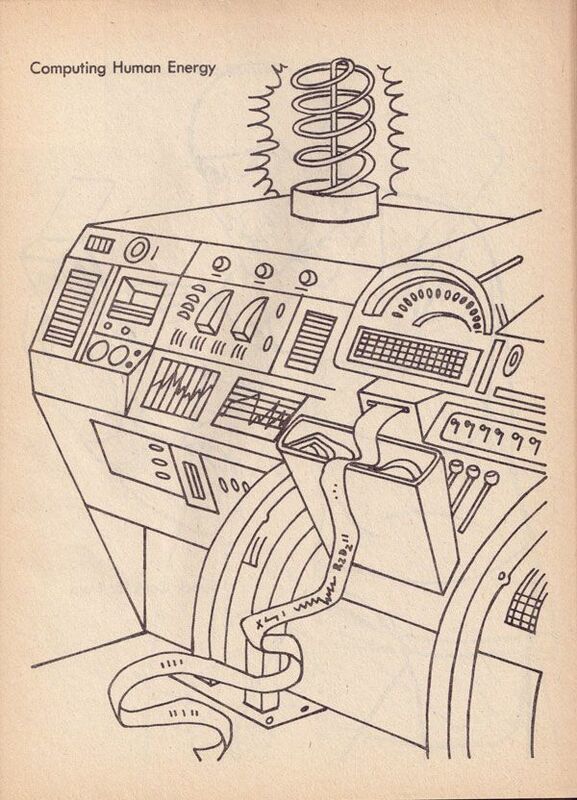 Next we have "Planet Ecnal's Dilemma". Another great Whitman cover! 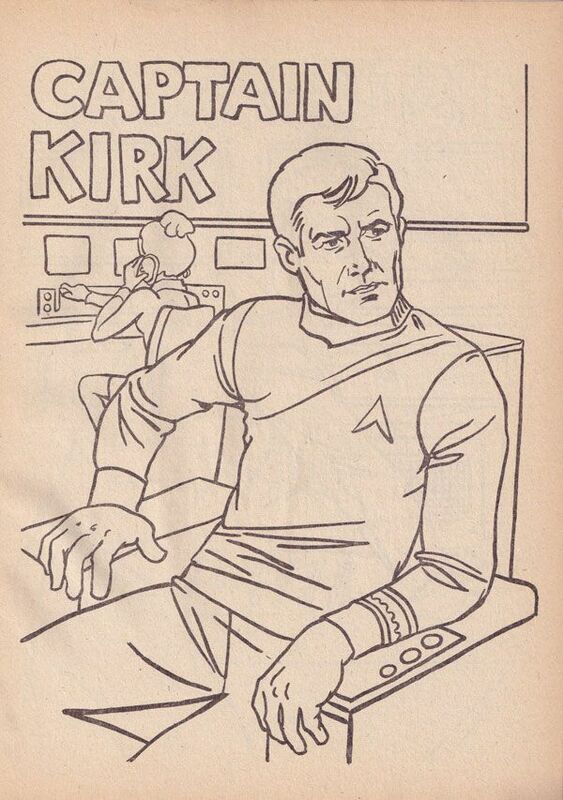 This one starts off with a bunch of introductory pages for the crew, including this great shot of Kirk. 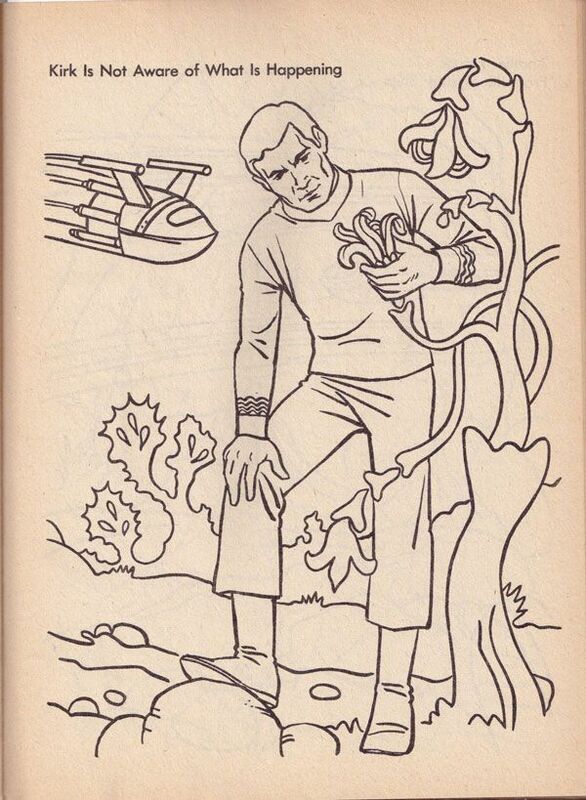 He oozes suave even in a kid's coloring book. So what exactly is Ecnal's dilemma? Well their planet is losing all life and they have no idea why. Ouch. That's a bummer. 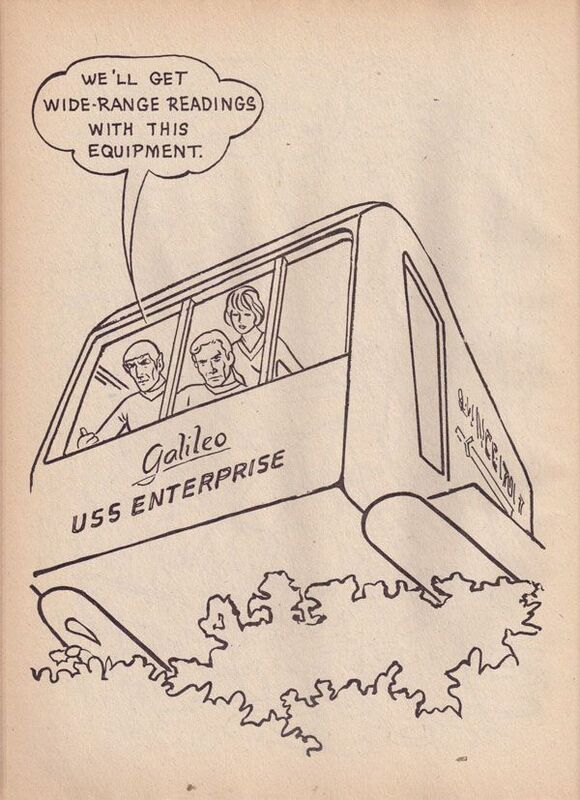 Flying around in the shuttlecraft. Shooting videos of sad tree guys for submission to AFV. 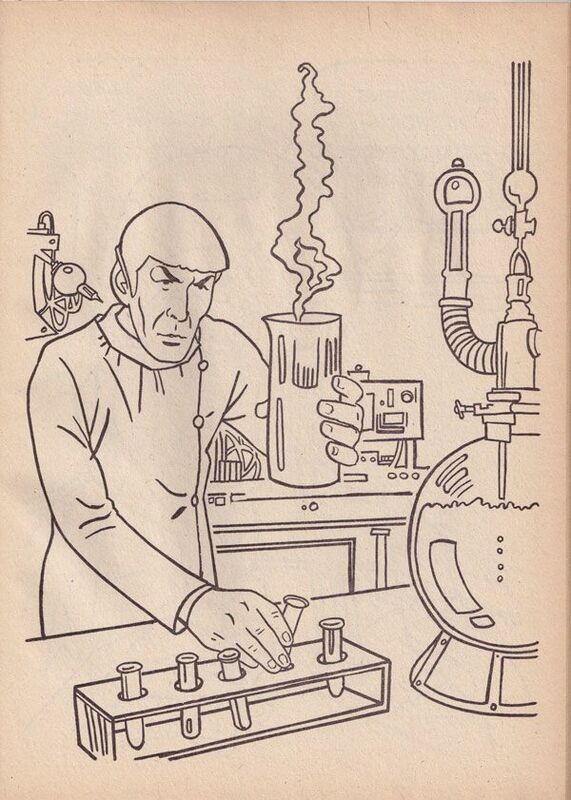 And Spock putting on a lab coat and playing with a chemistry set. 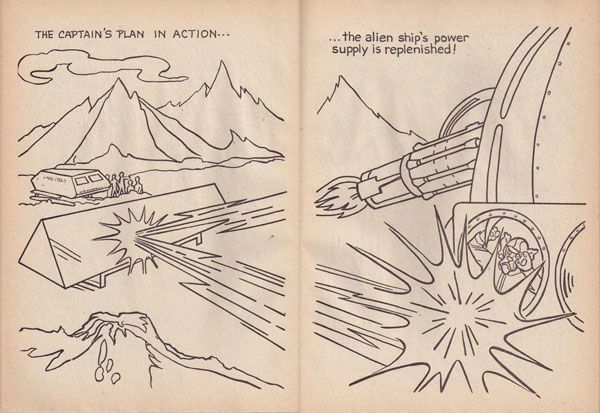 All of that leads them to find a giant freaking ship sitting on the surface draining Ecnal's power to replenish theirs. 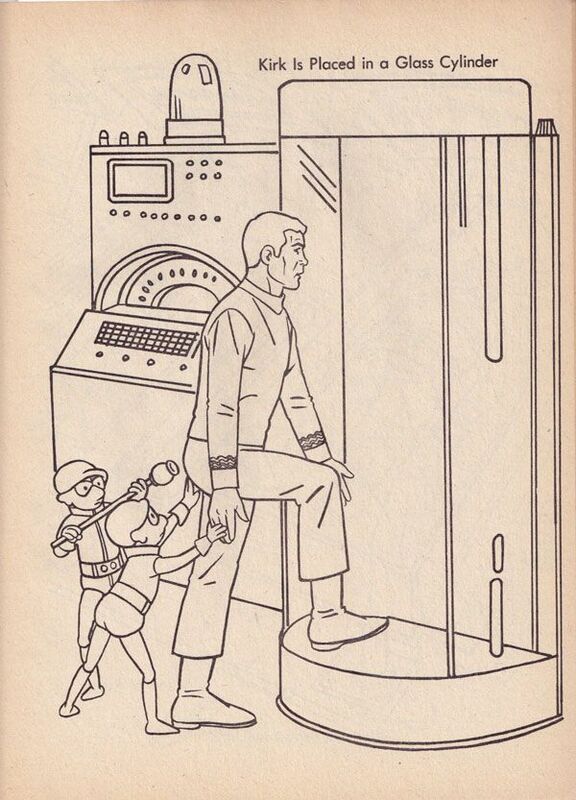 Not really sure how Spock working in a lab lead to this discovery. The people of Ecnal implore the Lerows to stop what they are doing so that the planet can survive. 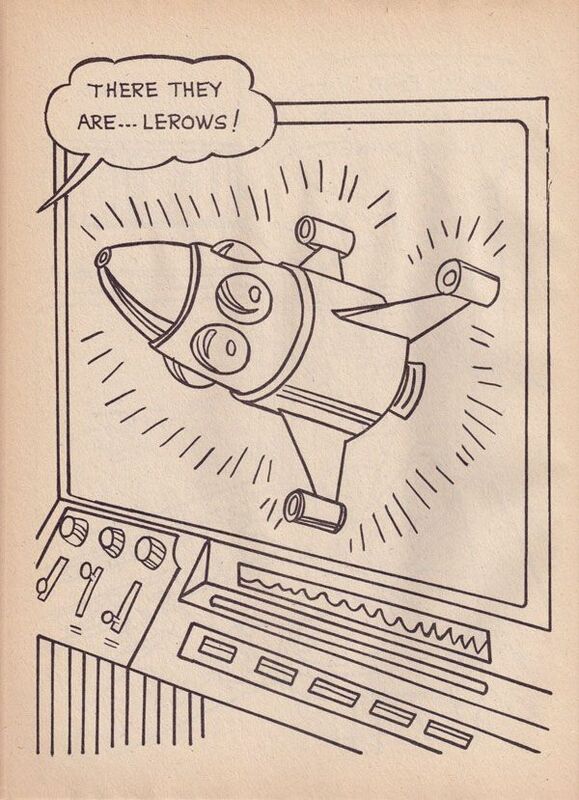 The Lerow's respond by basically saying "screw you". Jerks. 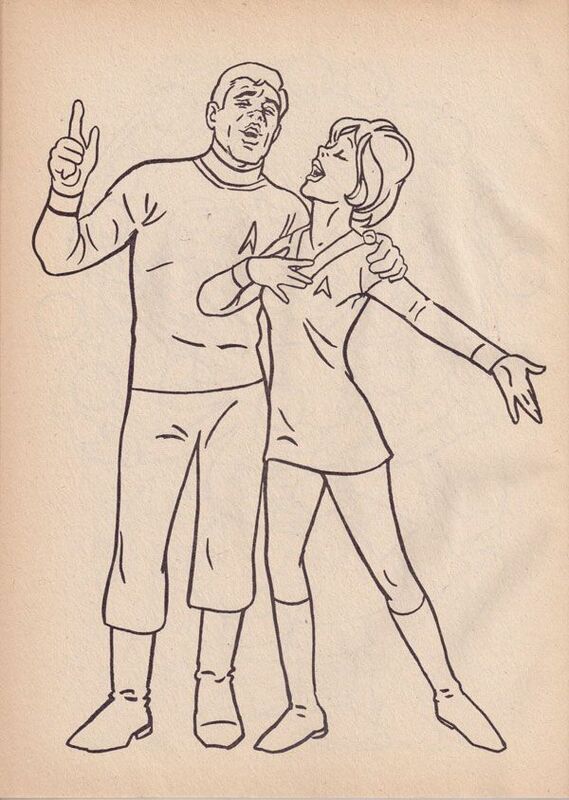 ...where of course Kirk and Uhura break into song. All's well that ends well, and the crew heads back up to the ship... all looking just about as confused as I am after reading this. Fun stuff, huh? 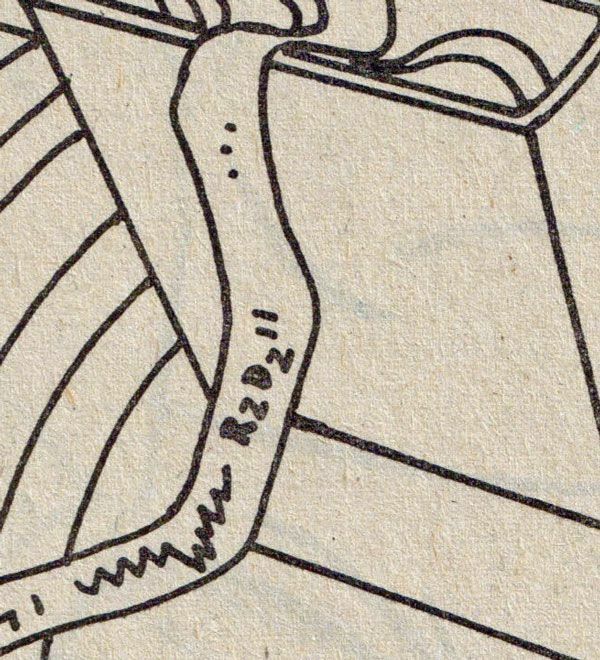 I ended up scanning more pages than I originally planned on in the hopes that some of the folks out there with young kids will print them out and have some coloring time with them. Enjoy! 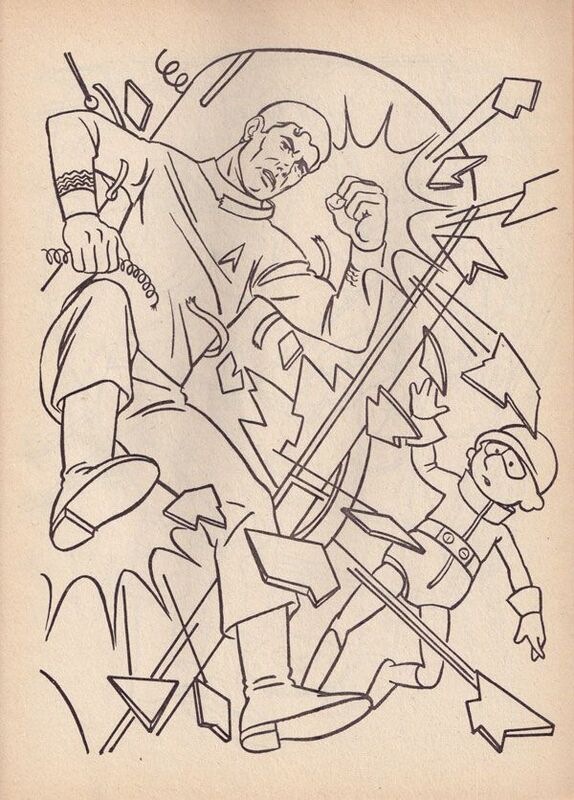 "I ended up scanning more pages than I originally planned on in the hopes that some of the folks out there with young kids will print them out and have some coloring time with them. Enjoy!" What an awesome thing to do, I have to print some for my nephew, I got him into Spider-Man and Batman, time he moved into Trek!